More than a third of British Airways flights from Heathrow were cancelled as thousands of passengers faced a second day of disruption. The airline apologised to customers for the issue, which is thought to have been caused by a problem with the IT system's power supply. In a statement released on Sunday, chief executive Alex Cruz said: "I know this has been a horrible time for customers. We're not there yet, but we are doing our very best to sort things out for you." 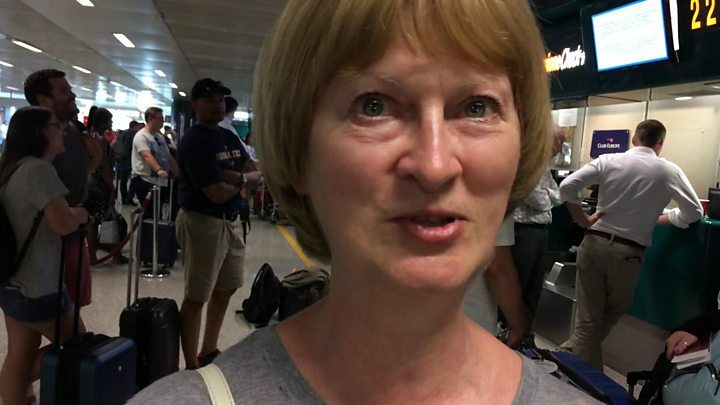 The BBC's Phillip Norton, who has been stranded at Rome airport since Saturday, has been told he won't be able to fly back to London until Tuesday. Ashley Tracey, who was trying to get to Mumbai for her friend's wedding, said she had been queuing to rebook her flight for six hours. She said: "There's no information I can't seem to get through online, I don't live here so I don't have a phone that works here." 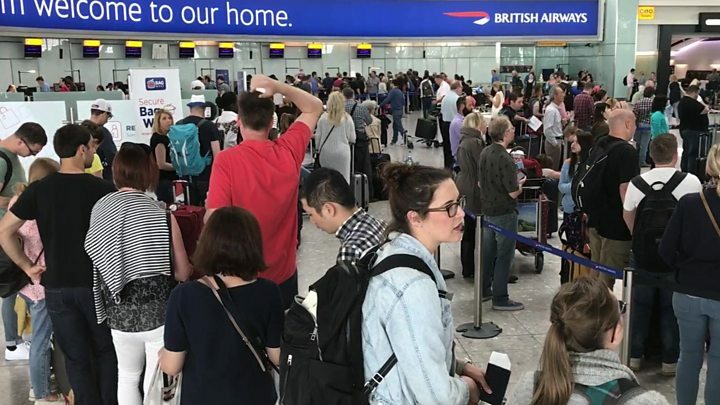 On Sunday morning, Heathrow Terminal 5 descended into chaos again as people arrived to rebook flights after theirs were cancelled yesterday as well as new arrivals hoping they had not been affected by the company's IT failure. A number of people arrived at the airport for 05:00 and were still none the wiser by lunch time whether they'd be home any time soon. But the terminal is still full of hour-long queues and for many this wasn't how they had hoped to spend their Bank Holiday weekend. Terry Page, 28, arrived in Fort Worth, Texas after delays and said "about 50" passengers did not have their check-in luggage. A spokesman said staff were "continuing to give passengers free water and snacks". On Saturday passengers described "chaotic" scenes at the airports, with some criticising BA for a lack of information. BA said although some of its IT systems had returned, "there will be some knock-on disruption to our schedules as aircraft and crews are out of position around the world. BA denied the claim, saying: "We would never compromise the integrity and security of our IT systems".